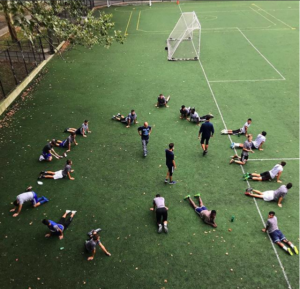 At Celebreak, one of the top leagues for amateur soccer players in Barcelona, we know a great pitch when we see one and New York City has quite a few of these fields to offer. When in the city and wanting to indulge in a quick soccer session, these parks combine both the busyness of the city, as well as its beauty. Here are the Top 7 soccer fields to visit if you are in the area and ready to jump in a game! Pier 40 is situated within the Hudson River Park, being the largest at 14 acres. This pier is located at the cross at W Houston St. or Clarkson St. in Greenwich Village. 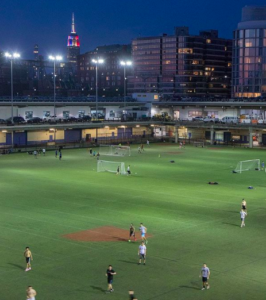 The pier is home to an indoor youth field, a rooftop field, and two courtyard fields. A beautiful field and an even better view. 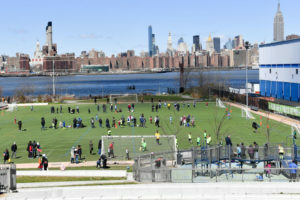 Play soccer while having the East River as your backdrop. 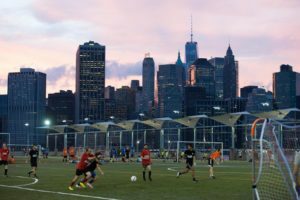 Pier 5 at the Brooklyn Bridge Park will have you contemplating whether to get up and play, or sit and spectate. The beautiful views of the skyline make it the perfect place to jump in a soccer game or still have fun will you rest and take in the amazing view. A beautiful mutli-use field that is the home for many for soccer, american football, and baseball games. This field also comes with an integrated track field. Score a couple of goals and have fun while being right next to the East River. 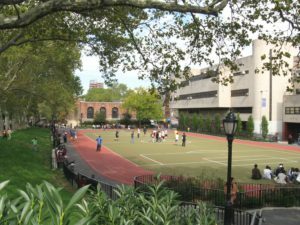 Named after President Franklin D. Roosevelt’s mother, Sara Delano Roosevelt, the park is situated in the lower east side of Manhattan. Its naturesque feel attracts many throughout the year, and if you are lucky, you might even run into a celebrity or two during the summer when retired basketball player Steve Nash hosts his celebrity soccer event there for his foundation. Stretching over almost 400 acres, Riverside Park offers a variety of amenities. 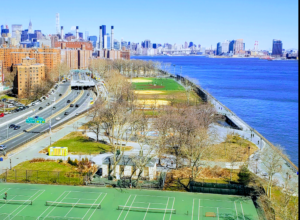 With 5 soccer fields to choose from, the hardest choice will be which one will give you a better view of the Hudson River while you play a match. 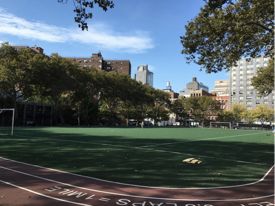 Located in Manhattan, Chelsea Park offers a great, multi-use, turf field to the community. With many trees all around, this shade filled park is the perfect place to gather some friends and play a game. Want to play soccer on these amazing fields? From Barcelona to New York City, CeleBreak is coming to a soccer field near you! Join us now!